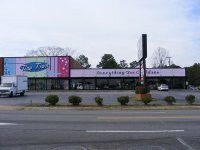 Located at 3015 Fort Bragg Rd in Fayetteville, NC. Tiny Town is a complete children’s department store that offers clothing from infants to size 16. A Will’beth customer since 2001, you can find a large selection of our newest christening, knits, boys rompers and accesories. The store’s co-owner Marcie Justice continues serving the community with the help of her mother Mrs Herbert founder of the store over 60 years ago, who still is a regular at the store. A retail spotlight of the store was published by It’s A Kid’s World Magazine article by Janet A Jacobs in the Volume 26 edition.